It’s that time of year again, the time of year when lower-level soccer clubs across Europe are fighting for Champions League qualification. While the top-flight European league place their top finishers right into the group stage, the domestic champions of nations like Kazakhstan, Romania, Azerbaijan, Slovakia, and, yes, Israel, have to make their way through a handful of qualifying rounds in order to win the right to play in the Champions League come fall. By the end of August, 10 small market clubs will emerge from this dogfight and be entered into the group stage with 22 automatic qualifiers from across Europe. This year, Israeli champion Maccabi Tel Aviv is taking their show on the road, literally, as they fight for a place in the Champions League this season. Given the rocket fire from Gaza, UEFA has forbidden Maccabi from hosting any games, so the blue-and-yellow are forced to play their home matches in Cyprus for the time being. This past week, it wasn’t an obstacle, as Maccabi eased past Andorran champion Santa Coloma 2:0 in Larnaca and advanced 3:0 on aggregate into the 3rd qualifying round. Next up is Slovenian champion Maribor, who Maccabi will face on July 30 in Slovenia, and then on August 5 on Cyprus. Maccabi should have the edge in the matchup (they are #94 in UEFA’s club rankings, while Maribor is 106), but without a real home game qualification will be more difficult. Should Maccabi win the home-and-home they’ll have one more matchup to qualify for the group stages, which will bring with it six guaranteed matches and a handsome payout of at least a few million Euros. 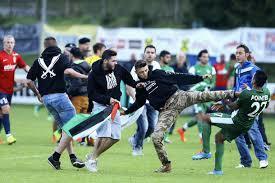 Unfortunately, though, it’s not just Hamas rockets that are interfering with Israeli soccer this summer. Earlier this week, Maccabi Haifa was playing a pre-season friendly against the French club Lille in Austria when the field was invaded by pro-Palestinian activists who began attacking the Israeli players. Luckily, the Haifa players escaped unharmed, and eventually the security forces were able to stop the brawl, but it’s a sobering reminder that even on the football pitch the ugly spectre of war, violence, and anti-Israel hatred can surface. The video and pictures from the pitch invasion in Austria can be found here.